When you think of Belgium, french fries, beer, chocolate and Brussel sprouts may come to mind, their famous decor style, or their international position as capital of the European Union and home to NATO. Or perhaps you think of them as the center of the world’s diamond trade, or home to the prestigious Royal Academy of Fine Arts, famous artists such as Rene Magritte and fashion icons such as Dries van Noten. But what you may not know is that Belgium is also home to the oldest fine leather goods house in the world. Founded in 1829, a year before Belgium declared their independence from the Netherlands and became a nation, the House of Delvaux quickly became known for their quality, craftsmanship and innovation, which continues to this day. When at Barney’s last week, the exclusive Delvaux distributor in the United States, I was transfixed by this incredibly creative short film playing by the elevator. By award-winning Belgian filmmaker Jaco Van Dormael, it takes you on a journey across Belgium with Delvaux’s Miniatures Belgitude, a collection of seven miniature versions of their signature Brillant bag, “each named after a Belgian city and representing a particular aspect of Belgian quirkiness and attitude – what we call Belgitude.” Why can’t all advertising be so beautiful and clever!! Bravo Delvaux – c’est magnifique! This entry posted in art, bags, design, fashion, film. Entry Tags: Barney's, Belgian design, Delvaux, fashion, Film, Handbags, Jaco Van Dormael Bookmark the permalink. SSSSHHHH! Delvaux is a Belgian secret! Only for those in the know! 1. Namur: capital of the French-speaking region. A frites decoration when you open the white bag, so it looks like the typical Belgian cone of fries. The keychain has a red fork, because Belgians do not eat their fries with their fingers. 2. Knokke le Zoute: swanky coastal town (zoute is Flemish for salt). 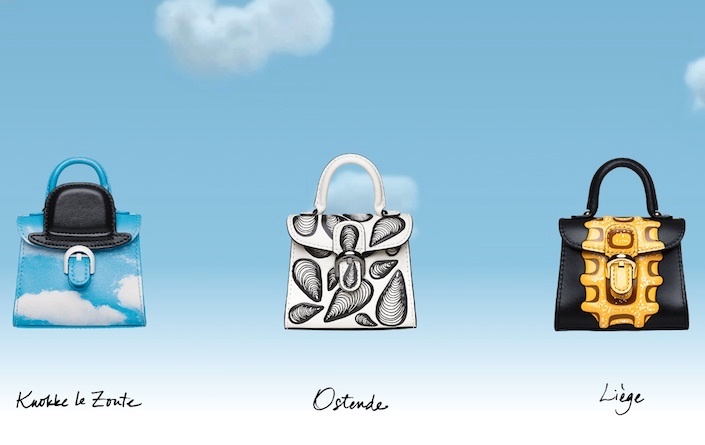 The bag has two of Belgian surrealist Magritte’s themes: a bowler hat and fluffy clouds on a blue sky. 3. Ostende: another coastal city. The bag is decorated with mussels, which with fries, are a signature Belgian dish. 4. Liège: former steel town, famous for its waffles (the big, yeast-raised kind). 5. Anvers: The Flemish city better known as Antwerp or, in Flemish, Antwerpen, capital of Flanders. I would have guessed diamonds, but the bag has balls in the national colors of red, yellow and black. 6. Gand: Ghent in Flemish. Magritte strikes again on the bag, which is a twist on his painting of a pipe with the words “ceci n’est pas une pipe”–this isn’t a pipe. The video plays with other Magritte themes, such as the green apple and twisted perspective. 7. Bruxelles: the capital city’s bag is decorated with the Atomium, a giant atom built for the 1958 world’s fair. Yes, giant atom sums up the surrealism. And the film shows it amid, what else, Brussels sprouts. Thank you Catherine! I got most of the references but missed the keychain with the red fork! Such a cute presentation! Just playing with your favorites! Love the idea! Awesome…loved it! Thank you, Stacey, for all your wonderful stylish tidbits that I would miss out on!! You uncover things I might never have seen. In spite of its promotional aspect the imagery is haunting and makes me think of the relationship between poetry and visual art. It escapes words. A good reason to keep coming back to your blog …….never know what might turn up here. 86 queries in 0.689 seconds.